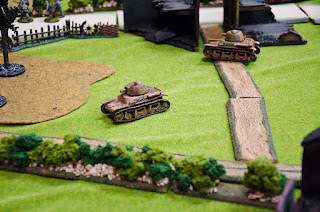 This month at the Trumpeter Society I hosted a game of Troops, Weapons and Tactics. 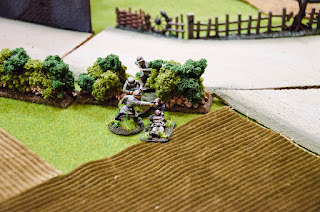 We played a scenario from the Red Devils Of The Orne book from Skirmish Campaigns. 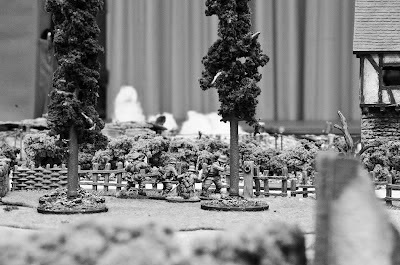 It is the "sequel" to a scenario I hosted two months ago, also with TW&T as the rules. I find I'm becoming more comfortable with these rules as I play them more, and the more comfortable I become the more I enjoy them. 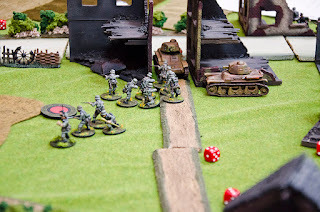 The fog-of-war and command-and-control aspects are especially well done, and they make for an unpredictable, chaotic, and very fun set of rules. 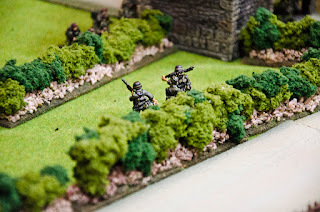 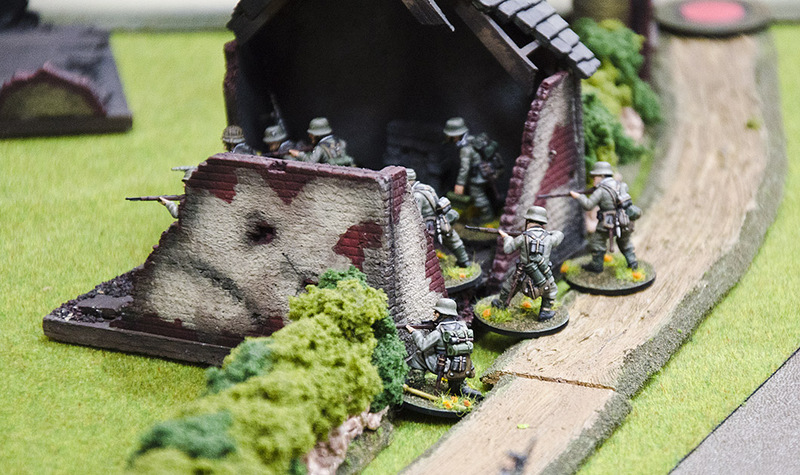 A newly-arrived German squad advances into cover. Two captured French tanks advance cautiously down the road towards the gatehouse. These troopers apparently like the cover they have in this house, because I haven't been able to make them move from it! 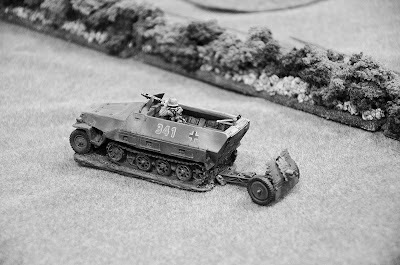 A German halftrack with infantry gun in tow heads cross-country down the German left flank to cover the pillbox there. 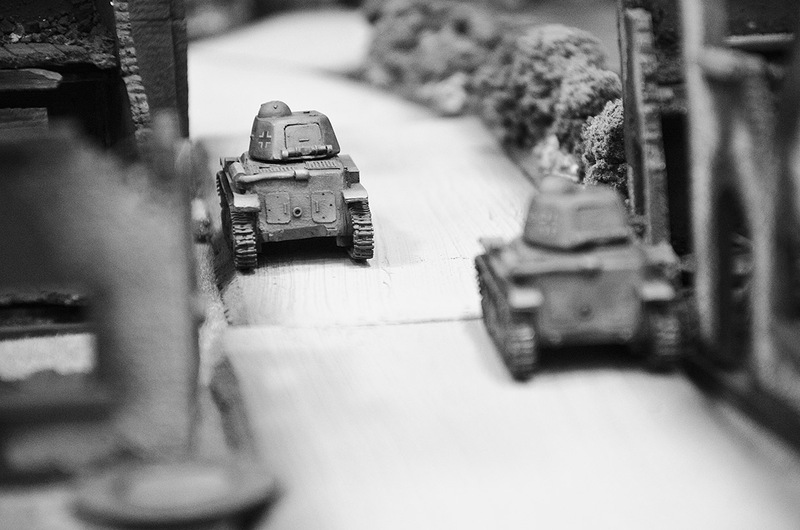 Traffic jam in the village! One of the tanks got stuck in the alley as the German troops crossing the road were pinned down by mortar fire. 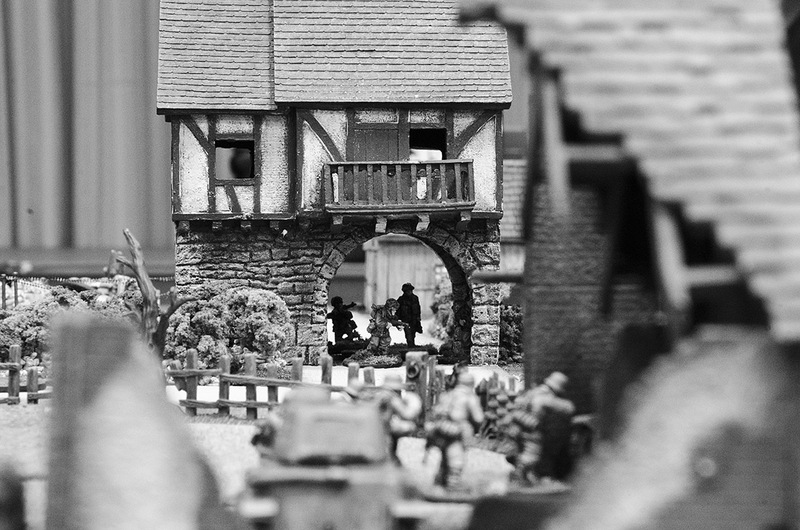 A view from the German deployment area, over a tank and some troops, looking at the Para defenders in the gatehouse. A German MG team sets up behind a fence to harass the enemy mortar. The remains of the German HQ team jump over a hedge and close-assault a Canadian bren gunner, the only survivor of the Allied MG team that was rousted out of a house by tank fire. 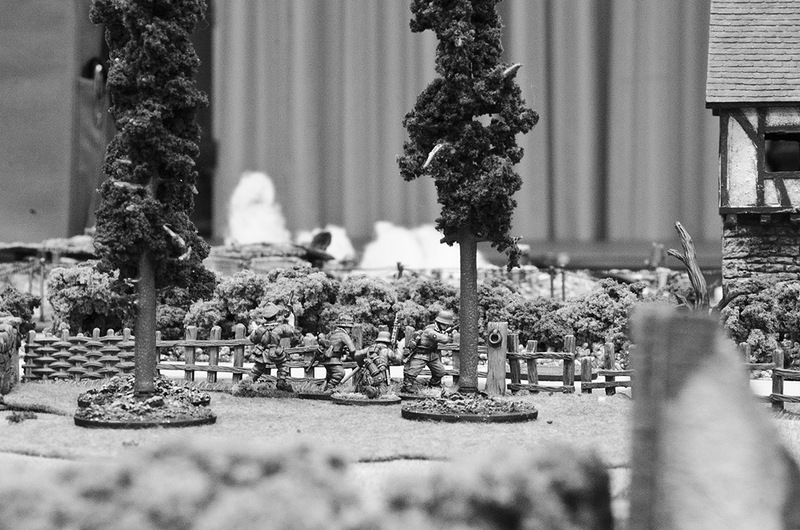 A German MG team that tried to jump the hedge and close assault the Canadian mortar position, only to get caught in the open and suffer some murderous fire. The Canadian HQ team, handing out the murderous fire. 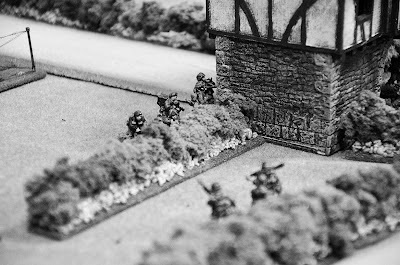 The German tanks slowly advance towards the gatehouse. Moments after this photo was taken, one of the tanks was knocked out by the Paras, manning a captured Pak-40 anti-tank gun. The game ended when we ran out of time at the end of the night, with the Paras still in control of the key building at their end of the table. 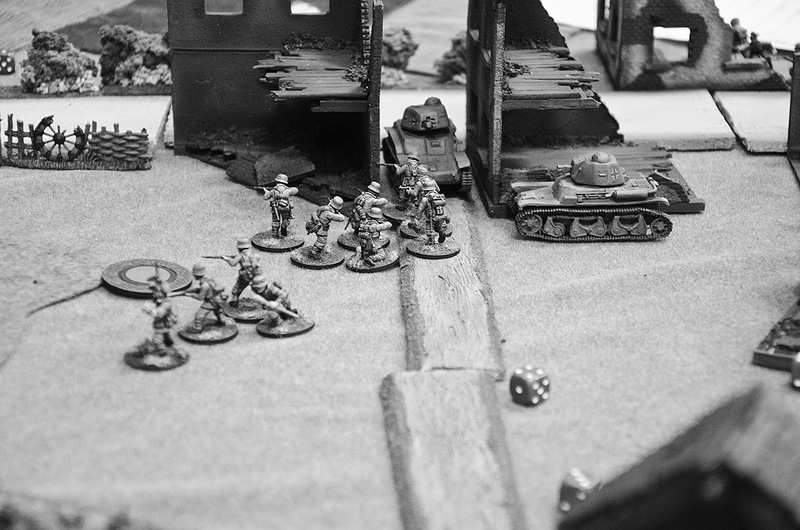 This is a really fun scenario - things look very grim for the Paras at the start, as they are faced with an overwhelming number of the enemy, who has tanks and an infantry gun in support. However, they do have the advantage of elite status, more dummy blinds and good defensive positions, and thus the Germans are forced to move with some caution or risk getting mown down. Boy your table looked great Friday night! The lads seemed to be having an excellent time. 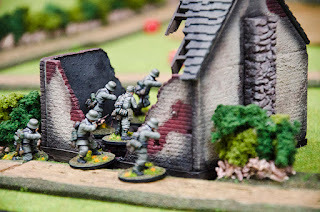 Sweet write-up, looking forward to more. a really nice AAR, thanks for sharing!